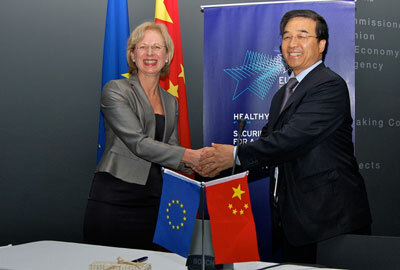 (Nanowerk News) The Chinese Academy of Inspection and Quarantine and the European Commision Joint Research Centre (JRC) Institute for Health and Consumer Protection (IHCP) have kicked off collaboration to support risk management and improve consumer protection through new approaches in the areas of nanotechnology and alternative methods to animal testing. Elke Anklam, Director of JRC-IHCP and Huailin Li, President of the Chinese Academy of Inspection and Quarantine, at the signing of the MoU on 6 June. On 6 June, the organisations have signed a Memorandum of Understanding at the occasion of the EU-China Food Safety Scientific Seminar at the Shanghai World Expo. Both institutions provide technical support for policy makers and aim to reinforce their co-operation in scientific research for consumer products safety. Nanotechnology is increasingly exploited in the development of novel and improved products and applications in areas as diverse as medicine, biotechnology, electronics, materials science, and energy technologies. The rapid increase in the utilisation of nanoparticles in industry and in consumer products is, however, causing concerns regarding the potential effects on health and on the environment. With today's globalisation of markets, food safety or consumer protection are no longer domestic issues, but need to be addressed in international collaboration. The JRC-IHCP has several years of experience in the field of nanotechnology, in particular regarding research in the safety assessment of nanomaterials, where it assesses the potential risks of particulate nanomaterials due to uptake and subsequent potential adverse effects on living tissue. The institute develops and uses the state-of-the-art computational and in vitro techniques to analyse the interaction of nanoparticles with cells and proteins. The IHCP has also a long tradition and expertise in the field of alternative methods to animal testing. The institute carries out scientific validation of alternative methods to animal testing developed and submitted by research laboratories.